Wishing all my faithful readers (thanks for being there on the sidelines) a very Merry Christmas! May your holidays be blessed and full of joy! Thank you for your comments and encouragement throughout the year. I am grateful you are here despite my sporadic posting. I am feeling a bit more encouraged and inspired in the decor department and am hoping to have some things to post about! Hard to post when you aren't inspired. No sense in boring you with recycled images and "filler" posts. I am looking forward to having a full house, enjoying TWO WEEKS OFF, and rejuvenating my mind and soul. I hope that you will be able to do the same. There are only 16 days left till Chrismas. Eek! I haven't even begun. But if you feel like giving a bit of handmade, then keep reading! 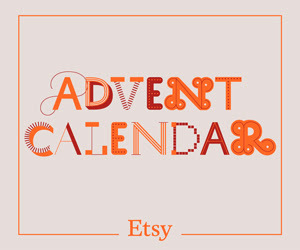 It was a thrill to be asked by Etsy Canada if I wanted to participate in Etsy International's DIY Advent Calendar! Yours truly's DIY is up today, featured on several international Etsy blogs! If you want to read it in English, check it out on Etsy UK. My DIY is an oldie that was up-cycled and revamped! So be sure to check it out. While you are there you can browse the previous 8 days worth of Christmas inspired DIY! or Etsy France, or Etsy Australia! With report cards behind me (woot, woot! ), my next few weeks planned for my class and my house almost decorated for the holidays, I am ready to start baking! Style at Home is running their annual Holiday Cookie Recipe Swap where you can possibly win a Kitchen Aid Mixer! I already have one, but would LOVE to win one for my sister. Wouldn't I be simply amazing if I gave her one for Christmas? Kidding aside, I love my sister and she works so hard to feed her family. My niece has an enormous amount of food sensitivities and my sister slaves to make sure her food tastes good and is balanced. On top of that my sis struggles with her own food sensitivities that are different than her daughter's. I think this mixer would be a perfect pick me up for her and to help her with her food prep! So I am digging out my recipe cards this weekend, and going to get my baking on with hopes to win that red beauty! Any baking plans for you? 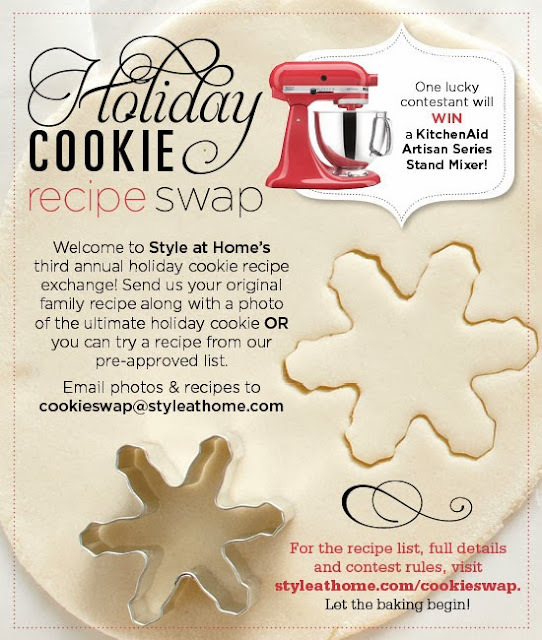 Any go-to holiday cookie recipe you love?